Kamel Saci's path to success from international sports superstar to world renowned bread baker would come down to just one thing: a torn ACL. A singular event, a "beautiful mistake" as Saci puts it, would change his life forever. Born in Gascony, France, Saci grew up in the small village of Vianne where, alongside two brothers, his father would instill a love for competitive sports. Saci quickly took to judo and was accepted at a local sporting academy in Bordeaux, where he would maintain an academic education while competing on a professional level. Over the course of ten years, Saci would excel at the sport, going on to win both national and international championships. In the midst of his sporting success Saci balanced school work; graduated from high school and eventually college, earning degrees in business management, accounting and communications. It was during a late season match at the age of 18 that Saci would tear his ACL; nearly ending what was just the beginning of a very promising career as a professional athlete. Not one to slow down, Saci sought out work to keep himself busy and make some extra money while he recovered from his injury. Intent on returning to judo the next season, Saci contacted a local temp agency looking for part-time work and was referred to a local bakery. Despite the substantial differences between bread baking and professional sports, surprising even himself, Saci came to love making bread almost immediately. Saci's newly discovered passion for baking would prompt him to rethink a return to sports and change course entirely. He enrolled at the National Institute for Bread Baking and Pastry in Rouen, France where he would earn specialization in artisan breads and viennoiseries. Upon graduating, Saci was hired by Eric Kayser, one of the most renowned bakers in Paris; placed in charge of production for the Saint Germain des Pres location.As the shop provided bread to surrounding businesses, this is where Saci would get his first taste of producing and supplying excellent quality baked goods to luxury hotels and upscale restaurant clients. From Paris, Saci would travel the world researching local recipes to marry the precision of French technique with the cultural baking traditions of the regions in which he was hired. His artistry, attention to detail, and efficiency in production would land him work in Russia, Mexico, Columbia, Brazil, Spain, the United Kingdom and many cities across the U.S. Throughout his career Saci's work has garnered industry praise and media attention. His creations for the London bakery l'Aubaine were served in the neighboring restaurants of renowned chefs Pierre Gagnaire and Joel Robuchon. In Barcelona, he helped fourth generation bread bakers develop the region's first wood-fired, organic bakery, Baluard Forn de Pa, which was acclaimed as one of the country's best. 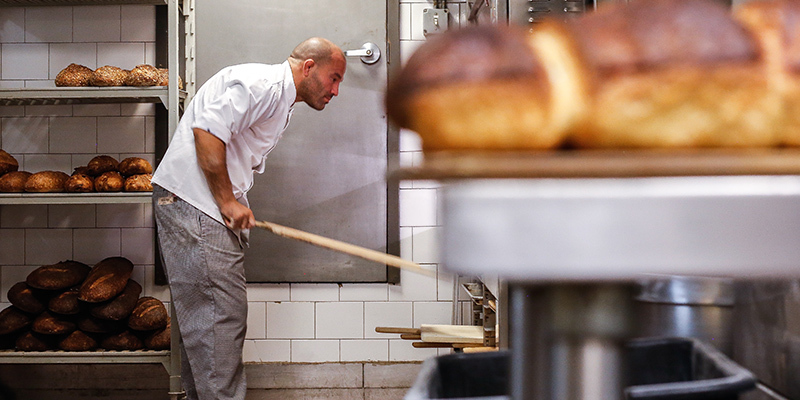 In New York, his bread program at the rustic Italian restaurant Il Buco Alimentari was recognized by the New York Times. Fluent in four languages, Saci finds it easy to offer support to businesses no matter the location or scale. In Barcelona and Madrid he helped to bring open kitchens from blueprint to reality for a chain of grab-and-go retail outlets. In Miami, he launched a large-scale wholesale bakery; training and managing a staff of over100. He developed and created menus for a variety of small-scale restaurants, bakeries and coffee houses including the Philadelphia location of cult-favorite, La Colombe. Most recently, Saci started to collaborate with the Swiss company Nestle to lead internal workshops focusing on quality control and global product innovation and by the authors behind the Modernist Cuisine books as a bread recipe tester. Today, Saci has formally established Kamel Saci Breads Consulting and is proud to extend his services to clients who appreciate the importance of high quality baked goods. Most days he can still be found making bread at Il Buco Alimentari; an exercise that keeps him sharp for his next consulting adventure and continually provides him a challenge, wich, like judo, requires constant dedication and regular practice to perfect. Kamel Saci can help you.